FIJI Airways men’s 7s team coach Gareth Baber will infuse his game plan when his side takes on the underdogs of the World 7s Series in the Dubai 7s tournament next month. The Fiji Airways men’s 7s team has been drawn in a tough pool in the opening round of 2018/19 World Rugby Sevens Series facing Kenya, Scotland and France in the pool matches. Baber said he will expect three different game patterns from their opponents. “The draw provides a mix of styles for us to combat. We are aware of the physicality that Kenya bring, Scotland will want to create pressure through moving the ball from edge to edge whilst France will look to individual game breakers to give them advantage. This is to keep us on our toes and hungry to put in place our game,” Baber said. Fiji has only won the Dubai 7s twice back in 2013 and 2015 before South Africa won the title back to back and will defend it this year. 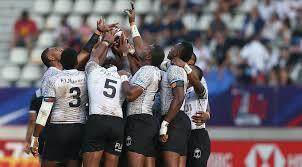 Meanwhile, the Fijiana 7s team are in Pool C with Canada, France, and Spain.